RolList Exontrol's new and innovative exRolList control handles and displays lists on an elliptic shape. The exRolList rotates the list to let items being visible, and so no scrolls are required. You never seen such of control so please take your time and check it. Your user interface will be rich, new and attractive. 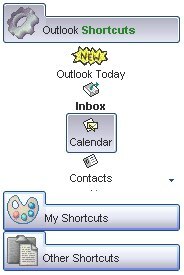 The Exontrol's ExListBar component, an accurate reproduction of the Microsoft Outlook Bar, provides an intuitive user-interface when large amounts of information need to be presented. The ExListBar component lets the user changes its visual appearance using skins, each one providing an additional visual experience that enhances viewing pleasure. Skins are relatively easy to build and put on any part of the control. Are you looking for a Windows XP ExplorerBar control? You can find it here. Are you looking for a new style of control? Then check the exRolList control. Shortcut bar support ( Ability to group the groups of items, in the shortcut bar ). Any item supports built-in HTML tags. eXRolList Exontrol's new and innovative exRolList control handles and displays lists on an elliptic shape. The exRolList rotates the list to let items being visible, and so no scrolls are required. You never seen such of control so please take your time and check it. Your user interface will be rich, new and attractive.